Historically, falchion come in two basic varieties: heavy and light. The heavier type arrived earlier and is a somewhat crudely made, heavy, cleaver-like sword. 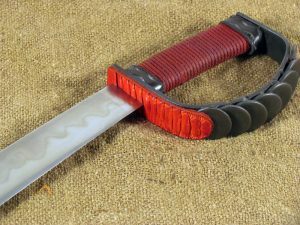 The lighter type is a longer and more finely made sword. They appeared in the eleventh century and persisted into the sixteenth century. Very few originals have survived to the present day. The heavier type was likely used by peasants and served as a chopping tool as well as a weapon. The more expensive lighter type was more likely owned by the wealthy, landed, and nobility, and was used only as a weapon. I think it’s likely that the peasant version was often made of iron, while the more expensive “weapon grade” version was usually made of steel. Steel was still very expensive during this time period, and it’s unlikely that peasant farmers and wood cutters had the wherewithal to acquire large steel weapons. 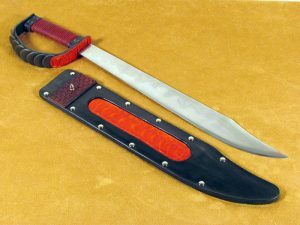 The falchion I made was intended as a functional fantasy piece. The customer gave me a general direction to move in, and I built the sword from there. 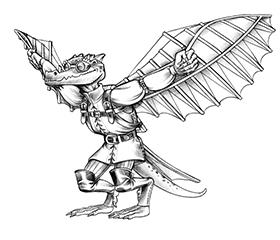 Wyrm Claw, as it came to be named, is made from 1080 steel and formed by stock removal (as opposed to being forged). It’s very light and fast, only 1/8” thick at the base of the spine, about 2” wide at the widest point, and about 22” long, overall. The blade most closely resembles the later, lighter design, but is shorter and thinner than a typical light falchion. The grind is convex, which provides the best geometry for high impacts. The heat treatment was done in my computer controlled oven for the pre-quench heating and the post-quench tempering. The temper was done at 600° F, yielding an RcH (Rockwell C Hardness) of 52-53. I used a clay coating to slow the cooling of the spine in the quench, and for creating a hamon. The hilt, by definition, is the guard and everything below it: guard, handle, and pommel (if present). Wyrm Claw has a simple cord-wrapped handle with leather bolsters at the top and bottom. The “D” type guard was fabricated from 1/8” x 1” mild steel with 1” diameter mild steel disks MIG welded to it, resembling dragon scales. The whole guard assembly was cold blued and MIG welded in place. At the top of the guard is a piece of ostrich leg skin, also resembling reptile scales. The sheath is several layers of cow leather with a Sam Brown Stud and ostrich leg skin inlay. The stud is used as part of a retention system that can include a belt, or a belt and a frog. 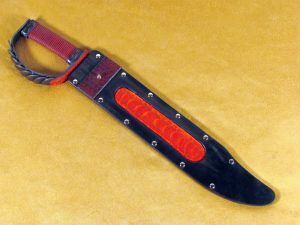 This size blade is right at the borderline of sheath material choices; it could have had a wood scabbard. 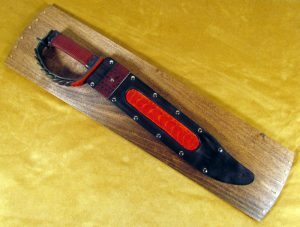 Because it was intended to hang on a plaque, I think a leather sheath was a better choice. Many, if not most, gaming systems categorize the falchion as a two-handed sword. This is, in my opinion, a mistake. While the older, larger falchion could have sometimes been a two-handed weapon, I’ve found no examples of the later, lighter version ever being anything but a one-handed weapon. This aside, I think that its use, in game, offers some relief from the more common sword types. And a little rules tweaking can go a long way toward making it more fun. I ordered this piece from Todd and it will be used as a weapon in the upcoming Awakened RPG and seen on the cover, it currently hangs on my wall near where I write to inspire me. I love it. THIS is why I love gaming and bladesmithing. The creativity keeps getting passed along and ideas keep circulating. Thanks, Hal! I’m so happy that you love it! Great little article. I also disagree with the 2-handed ruling some games have gone with and I’m not entirely sure why that became a thing. 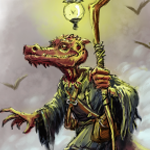 I *THINK* the falchion, if I remember correctly, was one-handed in AD&D 2nd edition, and it made for a nice little variant from the standard sword array.